Rainbow was a great dog with an incredible spirit. She is going to be missed for years to come because she left us with many, many good memories. She came into our lives when she was (we think) about six months old, and she never left even though she could of her own choice done this. 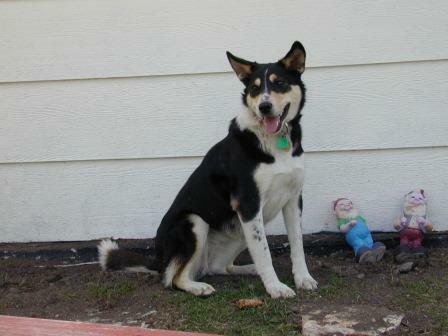 She chose to live with us after running off one afternoon – we then lived in Butte, MT. I watched, dumbfounded, as she took off after a bicyclist that was on the far side of a huge gully. She did not immediately return. I contacted Pete who was at school and we began searching for her. We were out for a few hours. When we returned home, she was on our front porch. She was exhausted and scraped up – we surmised that she had been hit by a car. She remained an independent sort, never running off for that length of time again, but sometimes running farther away than we were comfortable with. Rainbow was a dog with all the markings – she had two golden eye dots, white paws with speckles, a three quarter ruff, a white tipped tail, a narrow strip down her back forehead. She had three little black spots on her muzzle. Her muzzle was white and brown and had speckles. She was always up for an adventure and in fact went on two lengthy horse pack trips with us. We took her on a trip on the Missouri River, along with my friend Jacki and her daughter Eva and Pete’s brother Pat and his three children, Kaitlin, Emily, and Evan. She had so much energy – one minute she was running up a cliff and the next she was in river dead center, trying to get at the pelicans. She didn’t like car travel all that much, but did enjoy accompanying us when we were on foot, bicycle, and horseback. She never tired, that is until she got older. I knew she was getting old because we’d be out for trail rides and she would take a shortcut home. I worried about her then getting hit by a car, but she was very car savvy. Rainbow had many dog friends over the years. One of her first was Rolly, Pat Munday’s dog. Together, the two would course local areas, running in tandem, looking for game. Another was Annie, a local hound dog. I remember watching the two, at parties, chase one another around the perimeter of the cabins as parties were going on. Once she leapt over a chair a neighbor was sitting in. She was also an excellent Skijoring dog – she wasn’t into pulling per say, but rather, was a sight seer. She liked to be out and did pick up the pace considerably when she caught wind of a moose. Her final resting spot is here, next to Bootleg and Jenna. Bootleg was our first dog and Jenna was our second to last dog. All are loved, and all will be forever missed. Take care Rainbow, our hearts are with you.